In late 2003, I came back from Iraq, finished school, and started looking to buy a house. A few months later, I moved into a gentrifying area of Atlanta. I loved my little house, as long as it was never silent. Silence reminded me I was alone. Silence reminded me there were people shooting each other within 1/4 mile radius. Silence forced thoughts about topics I didn’t wish to explore. My first action upon entering the house at night was to turn on the radio or my CD carousel and play music while I fixed dinner, did laundry, talked on the phone, or got ready to go back out. When I’d wake up in the morning, my first action was to walk into the den and turn the receiver to WABE (90.1 on FM), so I could listen to NPR while getting ready for work. Now, I live in a larger house, and there are more people inside. So, while the clock radio still awakens me with WABE, a few seconds later, I’m down at the other end of the house starting my eggs. How do I keep up with the news during the back and forth between the kitchen and master bedroom? I use the TuneIn Radio app referenced in my last post to listen to WABE. See that picture of the cup of coffee? That’s what I see on my phone. 1) Download the TuneInn app for your device of choice (an iphone 6 for me). 2) Create an account. I used Facebook for mine, but an email address and password will do it, too. 3) Pick some stations to follow. 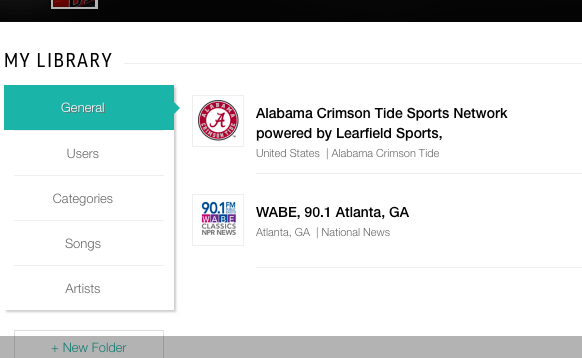 The picture at the top shows the ones I follow – Alabama sports and local public radio. I’m complicated. 4) Listen wherever you are–via your iphone, ipad, or whatever you got. Even use your computer, like I’m doing right now! I no longer fear silence, but I do enjoy staying informed about the athletic events I wish to follow and the news via sources I deem credible. And since I can no longer play background music at night at a volume that will fill the entire house, given the 3 children whose slumber I’d ruin, having music and news in my pocket is a welcome technological advance I’d recommend to anyone. Disclosure: I have partnered with, and was compensated by, Life of Dad, LLC and TuneIn for this promotion. But again, I was using this app anyway, so I figured why not put bread in my jar? I’m pretty sure the children appreciate that they get to keep sleeping, instead of rocking out at 11 pm to Queen’s Greatest Hits. Although they’d love it. And I appreciate having a happy husband who can get his audio fix.